The MA-TECH USA RB-120 downstroke baler is matched by no other. This unit weighs approx. 12,000 lbs. The frame is built to with stand the heaviest of forces. The RB-120 comes with a ten (10″) bore cylinder. 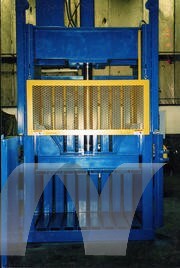 This allows the platen to deliver a full 235,000 lbs. of force. The frame work is manufactured from 6″ x 6″ square tubing. The RB-120 is designed for all nonferrous materials. With cylinders larger than industry standards, operating at 3000 PSI, and having one of the heaviest frames, this machine produces a heavier bale than the average downstroke baler. 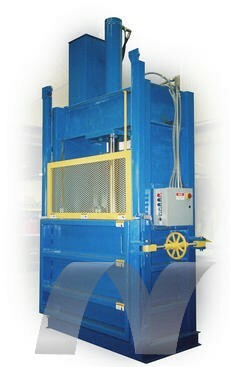 With a chain bale discharge, extracting the bale from the chamber is done with ease. Each bale comes with five wire ties, so losing a bale will never happen. An optional feed conveyor mounted in the back of the unit allows for operator convenience. Conveyor dimensions vary with application. The operator can feed from the front, rear, or both. An extra large door opening allows faster feed and thus higher production levels.